C E R T I F I E D ■ ITAR ■ IPC Class 3 Trusted Source QML ■ IPC J-STD-001 w / Space ■ AS9100 ■ ISO-9001 ■ ISO 13485 E Q U I P P E D ■ Established 1998 ■ Complex SMT Assembly ■ Five (5) Processing Lines ■ X-Ray, AOI, and SPI ■ Box Build and Wire Harness ■ Design and Test Engineering ■ Purpose-Built CM Facility I N T E G R AT E D ■ Design ■ Layout ■ Engineering ■ NPI ■ Supply Chain ■ Assembly ■ Testing E X P E R I E N C E D ■ Aerospace ■ Military C4ISR ■ Medical ■ Cyber ■ RF ■ Space ■ Unmanned Systems www.zentech.com • 443-348-4500 • sales@zentech.com © 2016 Zentech Manufacturing. All rights reserved. Electronics Contract Manufacturing & Engineering Services INTEGRATED. EXPERIENCED. CERTIFIED. EQUIPPED. 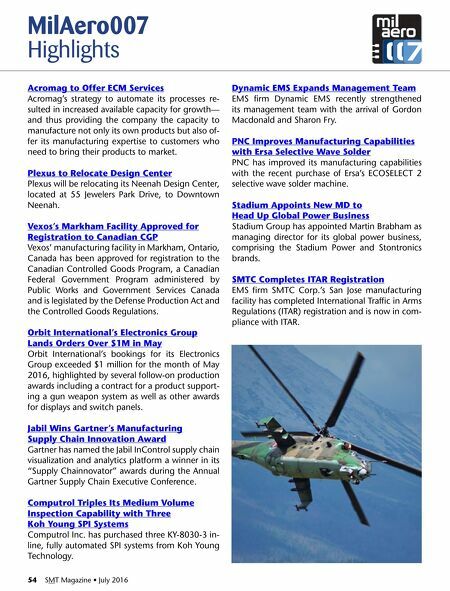 Above industry average commission structure and existing AVL status at most military primes. 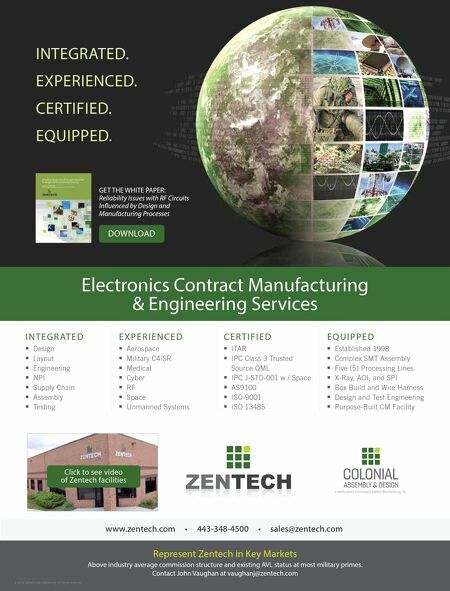 Contact John Vaughan at vaughanj@zentech.com Represent Zentech in Key Markets DOWNLOAD Click to see video of Zentech facilities GET THE WHITE PAPER: Reliability Issues with RF Circuits Inuenced by Design and Manufacturing Processes a wholly-owned subsidiary of Zentech Manufacturing, Inc.